The Standards and Guidelines Committee of the Society of Neurointerventional Surgery (SNIS), a multidisciplinary society representing leaders in the field of endovascular therapy for neurovascular disease, prepared this document based on a comprehensive review of English language literature relating to the topic. A literature search using PubMed (US National Library of Medicine) and Ovid (Wolters Kluwer) databases was performed from January 1, 1980, through December 31, 2016. The following key words were used: [(sinus thrombosis) AND ((cerebral veins) OR (cranial sinuses) OR (heparin) OR (thrombectomy) OR (anticoagulation))]. A review of references provided in review articles and textbook chapters was also performed. Studies published in languages other than English were excluded. Data on the natural history of CVT are limited, as most studies reporting the clinical outcomes of CVT include patients treated with anticoagulation.17 Studies of the true natural history of CVT are available from the ‘pre-heparin’ era or from the placebo arms of the early randomized anticoagulation trials of CVT medical therapy.18–21 Outcomes of these studies are summarized in table 2. Mortality in the small populations of these studies ranged from 14% to 40% in patients who did not receive anticoagulation. An algorithm for the diagnosis and management of CVT is shown in figure 1. An algorithm for the diagnosis and management of CVT. CTV, CT venography; CVT, cerebral venous thrombosis; ICH, intracerebral hemorrhage; LMWH, low molecular weight heparin; MRV, magnetic resonance venography; PRES, posterior reversible encephalopathy syndrome; UHF, unfractionated heparin. Clinical presentations of CVT are diverse, and are affected by the patient’s age, the interval between onset and hospitalization, location of thrombosis, and extent of the thrombosis.9 22 Common clinical signs and symptoms of CVT include headache, focal neurologic deficits, seizure, and diffuse encephalopathy, while rare symptoms include cavernous sinus syndrome and coma.4 Table 3 summarizes common presentations. The clinical significance and presentations of venous thrombosis depend on the location of the thrombosis and a patient’s venous anatomical disposition, especially collateral pathways. Thus, clinical presentation can be diverse and non-specific. For example, CVT should be excluded before making the diagnosis of idiopathic intracranial hypertension since CVT can present with the insidious development of papilledema.23 Crescendo-type progression of non-specific clinical presentations such as seizure or focal neurological deficit over a few days should raise a strong suspicion, and be followed with appropriate imaging studies for the diagnosis of CVT.22 Venous thromboembolism (deep vein thrombosis in the lower limbs or pulmonary embolism) may develop in patients with CVT. Right transverse sinus venous sinus thrombosis in a patient with head trauma. (A) Non-contrast CT of the head, axial view, shows a hyperintensity within the right transverse sinus (arrows) measuring >70 Hounsfield units, which is highly specific for acute thrombus. Bilateral frontal lobe hypodensities are consistent with the diagnosis of recent head trauma (arrowheads). (B) T1 and (C) FLAIR images of MRI brain performed 3 days after the initial head CT show an area of increased signal intensity within the right transverse sinus, consistent with subacute thrombus (arrows). (D) Time-of-flight MR venography and (E) contrast-enhanced MR venography demonstrate normal appearance of the superior sagittal sinus and left transverse sinus. No flow signal in the right transvers sinus and right internal jugular vein is seen. The goals of CVT management are to prevent the progression of venous thrombosis, re-establish venous flow, and manage underlying cause(s) of any prothrombotic state to prevent recurrence of CVT. Management of the underlying etiologies and prevention of CVT recurrence are beyond the scope of this document. Transcranial Doppler imaging has been used to non-invasively estimate intracranial pressure (ICP) in CVT.64 However, there is also evidence that the pulsatility index that is used as a surrogate marker of ICP in this method may not be accurate.65 Conflicting data exist for the role of external ventricular drainage or ventriculoperitoneal shunts in patients with CVT.66 67 These procedures can also be complicated by risks of anticoagulation. Decompressive craniectomy and hematoma evacuation are typically reserved for patients with CVT with large parenchymal lesions causing herniation.68–70 Surgical intervention can result in a good functional outcome even in the most severe cases of CVT.69 70 Early surgery (within 12 hours of admission), and younger patients are predictors of good outcome after decompressive craniectomy.68 There are no data to guide when to choose hemicraniectomy over endovascular management, or when and how to combine them in treating patients with severe thrombosis. Neurointerventional procedures for CVT management are considered in patients with clinical deterioration or progression of intracerebral hemorrhage/venous infarction despite anticoagulation, severe stupor, comatose presentations, deep CVT, posterior fossa involvement or major contraindications to anticoagulation, such as bleeding disorders, thrombocytopenia (<100×109/L), or recent GI hemorrhages.18 20 63 However, exact indications for neurointerventional procedures require further validation. There is insufficient evidence to determine which approach and/or device provides the optimal restoration of venous outflow in CVT.71 72 An illustration of the different approaches to endovascular therapy for CVT is shown in figure 3. 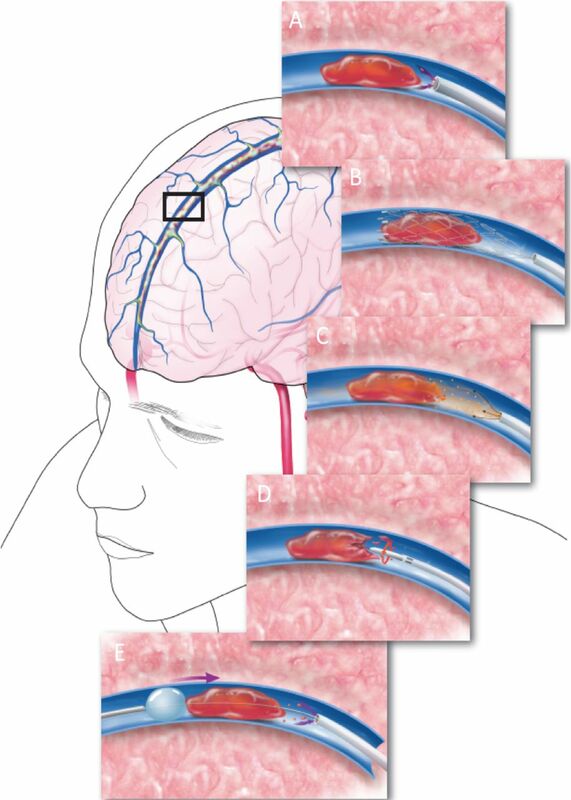 Illustration showing reported methods for venous sinus thrombectomy. These include (A) direct aspiration using an ADAPT technique, (B) mechanical thrombectomy with stent retrievers, (C) direct thrombolysis with local injection of thrombolytics, (D) clot disruption with Angiojet irrigation, (E) and mechanical suction with balloon-stabilized aspiration. A 4 or 5 French arterial sheath is typically sufficient for arterial access to perform diagnostic cerebral angiography. The venous phase, including the delayed venous phase, can confirm the location and extent of sinus occlusion as well as venous collateral pathways. For femoral venous access, a 6F long sheath will accommodate most thrombectomy devices, though a 7F or 8F sheath can be used to capture larger clot burdens with a larger catheter system. The guiding catheter or guide sheath is often placed in the internal jugular vein but if necessary can be delivered as far distally as the transverse sinus or torcular confluence. Also, an intermediate catheter can be used through the sheath, which can facilitate additional stability for endovascular devices. Direct access into the internal jugular vein provides alternative venous access, but access site thrombosis may compromise cerebral venous drainage if the contralateral jugular bulb is not adequate. Vines and Davis first performed intravenous pharmacological thrombolytic therapy for CVT using urokinase.73 Scott et al reported the first local urokinase infusion using an endovascular technique in 1988.74 Since then, there have been many reports using various thrombolytic agents with excellent to good clinical outcome.75–81 In cases of extensive CVT, following local intrasinus delivery of an initial bolus of a thrombolytic agent, a microcatheter can be placed within the affected sinus for a continuous drip. Continuous intrasinus alteplase infusion can be delivered at the rate of 1–2 mg/hour, and repeat angiography may be performed within 12–24 hours to measure the response to local thrombolysis to determine when discontinuation of such therapy is appropriate.82–83 The pharmacological thrombolysis technique can be combined with other thrombectomy techniques. A variety of approaches to stent retriever thrombectomy combined with other endovascular modalities have been reported. A stent retriever may be used alone as treatment or in combination with local pharmacological thrombolysis.87–88 A stent retriever may also be used as an anchor while the distal access (aspiration) catheter is passed back and forth to aspirate the thrombus.89 Alternatively, a stent retriever and thrombus are removed into the aspiration catheter or as a unit into the large proximal guide sheath under ongoing continuous aspiration.90 This allows the thrombus to be captured by both aspiration and stent retriever devices. Angioplasty and stenting are used as rescue therapy when other more traditional modes of thrombectomy fail.93 Angioplasty/stenting as a first-line endovascular treatment of CVT has not been evaluated. AngioJet (MEDRAD Inc, Warrendale, Pennsylvania, USA) uses hydrodynamic thrombolytic action through high-velocity saline jets.94 The aspiration force draws the thrombus debris to the catheter inflow zone where it is evacuated from the body through the catheter. In nearly all patients with CVT systemic heparinization will be initiated before the start of the endovascular thrombectomy thus requiring serial activated clotting time (ACT) measurements and adjustment of bolus doses of systemic heparin in the angiography suite. Intravenous heparin is administered to achieve an ACT of 250–300 s during endovascular therapy. Effective anticoagulation is essential for procedural success in patients undergoing interventional therapy, and adequate postprocedural anticoagulation is important for preventing re-occlusion postoperatively. Recanalization, either complete or partial, is associated with improved outcomes of CVT in comparison with patients with no recanalization, although the quality of data is limited by the small sample sizes in the studies that reported such an association.95–96 The goal of endovascular therapy is to re-establish anterograde venous outflow in the targeted sinus(es) to alleviate malignant venous congestion/hypertension and prevent its associated complications. A combination of MRI/MRV or CT/CTV studies should be performed in patients with suspected CVT (class I; level of evidence C). DSA as a diagnostic modality is indicated in cases of suspected CVT when the diagnosis of CVT cannot be reliably established with non-invasive imaging alone (class IIa; level of evidence C). Anticoagulation with unfractionated heparin or low molecular weight heparin is reasonable in patients with CVT (class IIa; level of evidence C). Decompressive craniectomy may be considered in patients with large parenchymal lesions causing herniation or intractable intracranial hypertension (class IIb; level of evidence C). Endovascular therapy may be considered in patients with clinical deterioration despite anticoagulation, or with severe neurological deficits or coma (class IIb; level of evidence C). The duration of anticoagulation therapy before declaring it to be a ‘failure’ and proceeding with endovascular therapy is unknown. There is insufficient evidence to determine which endovascular approach and device provides the optimal restoration of venous outflow in CVT. In many cases, a variety of treatment approaches is required to establish sinus patency. We would like to acknowledge the contribution of Tom Dolan in providing the medical illustration for Figure 2.
. Thrombosis of the cerebral veins and sinuses. N Engl J Med 2005;353:314–5.
. Cerebral venous thrombosis. Neurol Clin 1992;10:87–111.
. Thrombosis in the young: epidemiology and risk factors. A focus on venous thrombosis. Thromb Haemost 1997;78:1–6.
. A reduced sensitivity for activated protein C in the absence of factor V Leiden increases the risk of venous thrombosis. Blood 1999;93:1271–6.
. 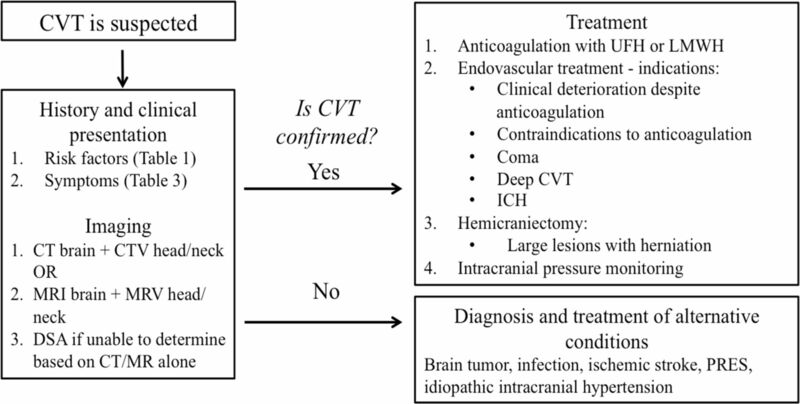 Imaging and treatment of cerebral venous thrombosis (CVT). Interv Neuroradiol 2002;8:5–14.
. Computed tomography of dural sinus thrombosis. AJNR Am J Neuroradiol 1981;2:539–43.
. Polycythemia mimicking venous sinus thrombosis. AJNR Am J Neuroradiol 2002;23:1402–3.
. Diffusion-weighted imaging patterns of brain damage associated with cerebral venous thrombosis. AJNR Am J Neuroradiol 2001;22:261–8.
. Parenchymal abnormalities associated with cerebral venous sinus thrombosis: assessment with diffusion-weighted MR imaging. AJNR Am J Neuroradiol 2004;25:1666–75.
. Diagnostic performance of routine brain MRI sequences for dural venous sinus thrombosis. AJNR Am J Neuroradiol 2016.
. Diagnostic value of multidetector-row CT angiography in the evaluation of thrombosis of the cerebral venous sinuses. AJNR Am J Neuroradiol 2007;28:946–52.
. Cerebral veins: comparative study of CT venography with intraarterial digital subtraction angiography. AJNR Am J Neuroradiol 1999;20:249–55.
. Anticoagulation for cerebral venous sinus thrombosis. Cochrane Database Syst Rev 2011;8:CD002005.
. Treatment of dural sinus thrombosis by urokinase infusion. AJNR Am J Neuroradiol 1994;15:801–7.
. Rheolytic catheter thrombectomy, balloon angioplasty, and direct recombinant tissue plasminogen activator thrombolysis of dural sinus thrombosis with preexisting hemorrhagic infarctions. AJNR Am J Neuroradiol 2004;25:1807–11.
. Cerebral venous thrombosis: combined intrathrombus rtPA and intravenous heparin. Stroke 1999;30:489–94.
. 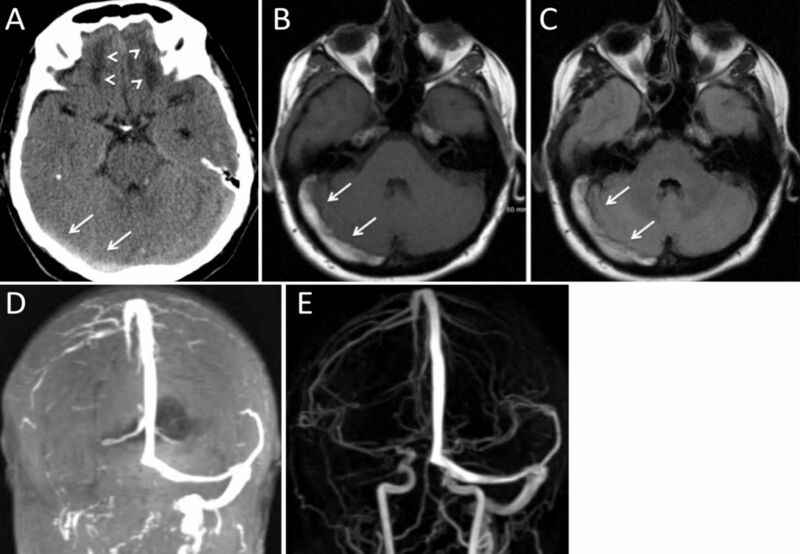 Direct endovascular thrombolytic therapy for dural sinus thrombosis: infusion of alteplase. AJNR Am J Neuroradiol 1997;18:639–45.
. Mechanical balloon thromboembolectomy for the treatment of cerebral venous sinus thrombosis (CVT): a restropsective analysis of safety and efficacy in 65 consecutive patients. SNIS 8th Annual meeting . Contributors S-KL was the primary author and was responsible for overseeing construction of the document outline, gathering of evidence, and drafting of the manuscript. He also contacted our guest author (MGB) as a topic expert, and sought her input. MM made major contributions to the manuscript draft, and supplemented entire sections of the text. He also participated in discussions about the outline and organization of the text. SWH provided review and additional text to the manuscript. JTF acted as a representative of the Board of the Society of NeuroInterventional Surgery, and provided commentary and editing on behalf of the Board and of the Society as a whole. MGB was the invited topic expert, whose knowledge and experience in venous thrombosis disease provided vital international perspective. JFF, as senior author, was responsible for organizing the writing group, overseeing the outline construction, facilitating communication between the writing group and the Standards and Guidelines Committee, drafting and editing of the manuscript, and submission/proofing for publication. Disclaimer This literature review (“Review”) is provided for informational and educational purposes only. Adherence to any recommendations included in this review will not ensure successful treatment in every situation. Furthermore, the recommendations contained in this review should not be interpreted as setting a standard of care, or be deemed inclusive of all proper methods of care or exclusive of other methods of care reasonably directed to obtaining the same results. The ultimate judgment about the propriety of any specific therapy must be made by the physician and the patient in light of all the circumstances presented by the individual patient, and the known variability and biological behavior of the medical condition. This review and its conclusions and recommendations reflect the best available information at the time it was prepared. The results of future studies may require revisions to the recommendations to reflect new data. SNIS does not guarantee the accuracy or completeness of the review and assumes no responsibility for anyinjury or damage to people or property arising out of, or related to, any use of this review or for any errors or omissions. Competing interests JFF is an equity interest holder for Fawkes Biotechnology, LLC, and a consultant for Stream Biomedical. SWH is a consultant for Medina and Neuravi, and has research contracts with Stryker Neurovascular, Siemens, MicroVention Terumo. JTF has research grants from Stryker and Microvention, equity interest in Endostream, Cerebrotech, and The Stroke Project, and has consulted for Stryker and Penumbra. MM is a consultant for Toshiba (Canon) Medical. All other authors report no relevant conflicts of interest. Collaborators T Abruzzo, B Albani, SA Ansari, AS Arthur, M Bain, B Baxter, KR Bulsara, M Chen, G Dabus, D Frei, CD Gandhi, MS Hussain, MV Jayaraman, Y Kayan, RP Klucznik, T Leslie-Mazwi, WJ Mack, RA McTaggart, PM Meyers, J Mocco, AT Patsalides, CJ Prestigiacomo, GL Pride, Jr, RM Starke, PJ Sunenshine.